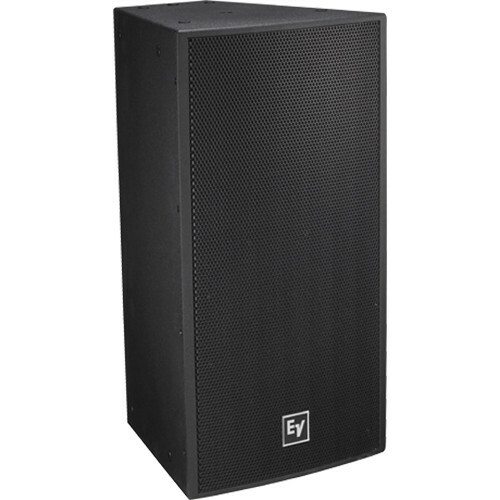 The black EVF-1121S Single 12” Front-Loaded Semi-Outdoor Bass Element System from Electro-Voice is a high power, front-loaded bass element that can be used in a variety of applications where high quality sound reinforcement is required. It utilizes the EVS12SB 12” woofer used FEA optimization for motor, suspension, and electrical design to ensure very low distortion and maximum intelligibility at high SPL levels. Its features makes it suitable for many fixed install applications, including applications with full exposure to outdoor elements. The trapezoidal enclosure is constructed out of weather resistant birch, and coated with EVCoat for maximum protection from outdoor elements. This PI-weatherized subwoofer system is rated for outdoor exposure only in protected areas such as under a roof overhang. The acoustic and rigging design allows for vertical and horizontal clusters to be built using any combination of loudspeakers from the entire EVF & EVH series. The input panel features a Phoenix-style connector and included gland-nut cover plate.